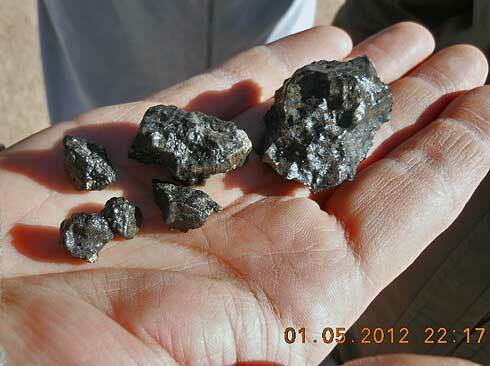 My name is John Higgins in addition to being an inventor and business owner, I am also an avid hunter of meteorites. 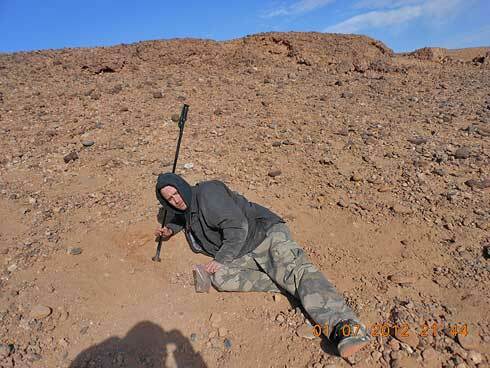 To me, meteorite hunting is the ultimate sport. There is no greater feeling of euphoria than finding a meteorite from a fresh fall. And it’s just as rewarding to appreciate being out in nature, taking in the majestic grace of the big sky above and focusing in on the details of every rock at your feet. What’s more, meteorite hunting is both beneficial to science and financially rewarding. The memories you make and share with others while meteorite hunting imparts a lifelong connection. 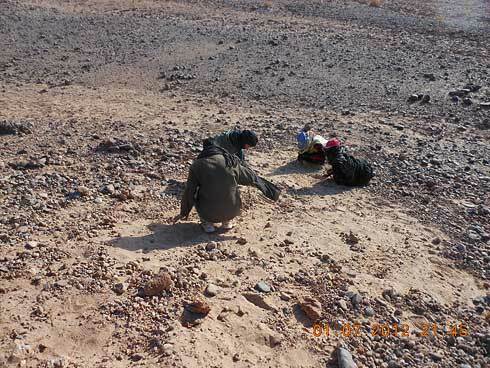 A meteorite hunt I undertook in January 2012, in the South of Tata, Morocco, is one example. The first week of January 2012: the jet wheels screeched as they touched down on the runway in Casablanca! 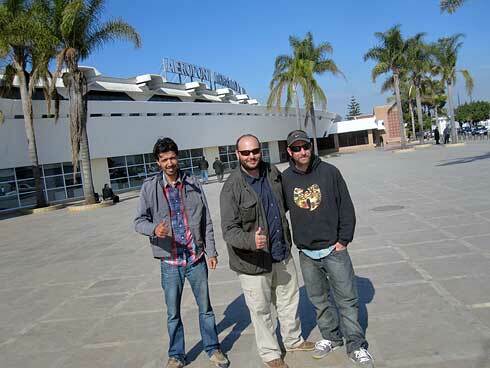 At the airport I met with my hunting partners Derik and Aziz. We jumped in a 4×4 to make the five-hour-long dangerous downhill drive to Agadir, Morocco. 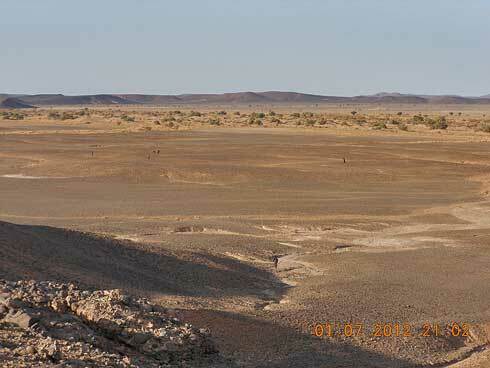 We embarked on this journey in hopes of finding the recently discovered Martian meteorite. Our first mission was to find the strewn field, even though we were not exactly sure where to start. In the next several days, we traveled to the towns of Tata, Tissint and Foum Zguid trying to get clues about the field’s location. Finally, as we were driving south from the small village of Tissint, we met an old man standing on the side of the road who furnished us with a valuable piece of information. He advised us to head south of Tata toward a mountain range where we would find an off-road desert trail that split into two paths. One way led to the Moroccan army base, that we naturally wanted to avoid, while the other way led to the strewn field that we so desperately wanted to reach. We decided to tempt fate and carefully made our way down the trail in our Land Cruiser 4×4. When we got to the infamous fork in the road, we chose the path on the left, unsure of where it would take us. The heavens were surely favoring us that day because a little way down the path was another meteorite hunter and longtime friend of our guide. 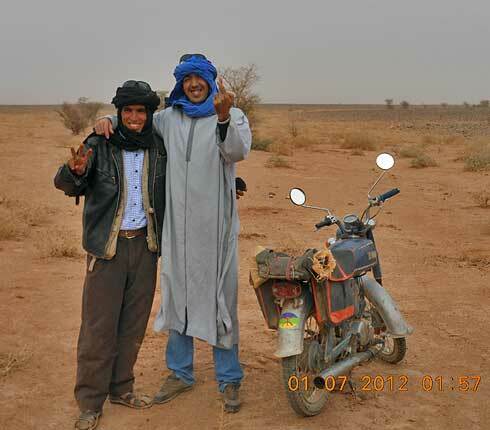 He was standing there in his traditional headdress alongside his motorbike with a conspicuous sticker on the rear fender that proudly displayed his Berber heritage. Mohammed was his name, and after we exchanged a few quick greetings, he agreed to lead us to the strewn field. We followed Mohammed on his motorbike for about 30 minutes down a trail so craggy and rugged that the Land Cruiser bottomed out several times. This trail was so rough that the 4×4 became stuck, forcing us to get out and search for desert brush that we placed under the tires for traction. Still it required a great deal of pushing and rocking the vehicle to free it from the sand traps. One ditch was so bad our driver Aziz bounced his head on the windshield causing him to bleed profusely all over our equipment. Talk about taking one for the team! Meeting Mohammed in the desert, fingers crossed for good luck! It was an unpleasant and bumpy ride to say the least, but finally we arrived at the strewn field just as dusk was falling. At that point Mohammed cautioned us to lay low as we were just a short distance away from the river basin where some rival meteorite hunters were previously camped. He warned us that they were possibly equipped with weapons, and they might not take too kindly to seeing Americans come in to scoop up their treasures. Unfortunately, keeping a low profile was already out of the question because upon our arrival, our Land Cruiser had become impossibly wedged on another sand dune. We were stuck and without the help of another 4×4 vehicle to pull us out, all we could do was set up our tents, cross our fingers and wait until morning. We spent that first night in the tent never knowing what to expect, but our shovels, picks and hammers were kept at arm’s length for protection. 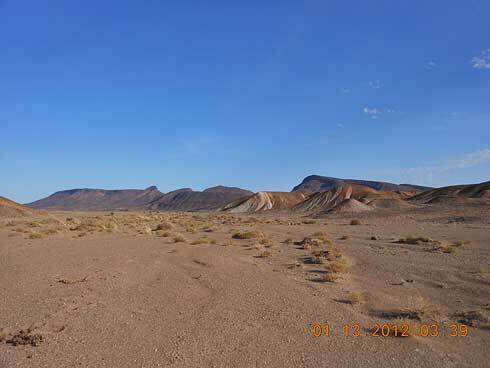 When the sun rose, we awoke to the noise of motorbikes and many 4×4 trucks as the local meteorite hunters in our proximity headed out to comb the desert. To our relief, we discovered most of the camps around us were filled with friendly tribes of meteorite hunters who knew Aziz and Mohammed. They greeted us like old friends and quickly helped get our 4×4 unstuck from the sand dune it was tightly wedged into the night before. 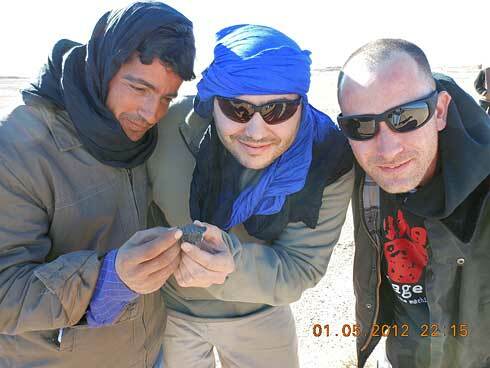 The meteorite hunters we met that day were from many parts of Morocco. They joyously shared water, food and tools to all those nearby. It was most fortunate to meet other experienced hunters who were genuine, helpful and who wanted to contribute to our mission. 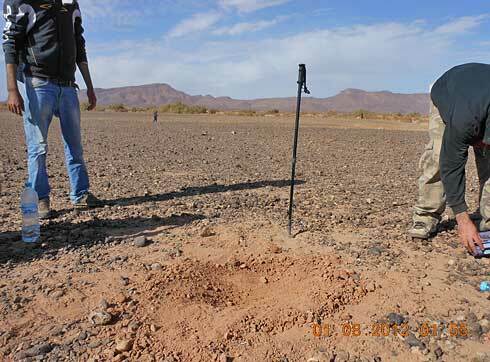 We met up with the elite of Morocco’s top meteorite hunters! It was time to get to work so we asked our new friend Mohammed to show us all the locations where meteorites had been found. This was easy for him because he was a strewn field veteran, who successfully hunted the strewn-field for two weeks prior to our arrival. Mohammed had vast knowledge of all the find locations. We took out our GPS units, maps and notebooks and plotted each impact location where every known Martian had been found. Meteorite hunters have the potential to make significant contributions to the scientific community. I can’t emphasize enough how essential it is to preserve scientific data collected during a hunt. Sharing accurate information with the meteorite community can lay the groundwork for future explorers. Thanks to a formal university education in archaeology and anthropology along with life experiences, I knew the importance of recording the details during this expedition so similar researchers can benefit from the data. Gathering this information on the field took us about three days, but I’m proud to say that we successfully collected the most complete and accurate strewn-field data from the most important Martian meteorite fall in the past 100 years. This data allowed us to study the strewn-field dynamics and meteorite trajectory, which greatly helped with the hunt over the next several days. In addition to the strewn-field data, we also had a few secret weapons on our side: our Meteorite Sticks. Conventional wisdom will tell you Martian meteorites are not magnetic, but luckily for us, the Meteorite Stick’s rare earth magnet was so strong that even the small Tissint fragments stuck to it. The known strewnfield extends to the foot of the mountains. Picture showing South to North view. Sifting through the dirt at each impact location the magnet easily recovered Martian fragments that other hunters before us had missed. Like magic, the small Martian fragments that would have been forever buried in the dirt were carefully collected from the magnetic tip and placed in plastic bags. Day after day we searched from dawn to dusk, up high on the ridges, down low in the dry river basins, and trudging through sand dunes. At times I thought my feet would fall off. To stay alert, I made sure to stop and appreciate the beauty of the land, staring in astonishment at the red desert that truly resembled a Martian landscape. This appreciation for the environment kept me focused, and at times I felt that being alone in the desert was spiritually uplifting. There was nowhere else I would rather be. Documenting Tissint was a major accomplishment; one that represents not only a personal achievement but also a contribution to the world of science. In addition to our great discoveries, we also rejoiced in the fact that we were taking part in the expedition of a lifetime, thanks in no small part to hunting with the Meteorite Stick. What Makes the Meteorite Stick So Special? 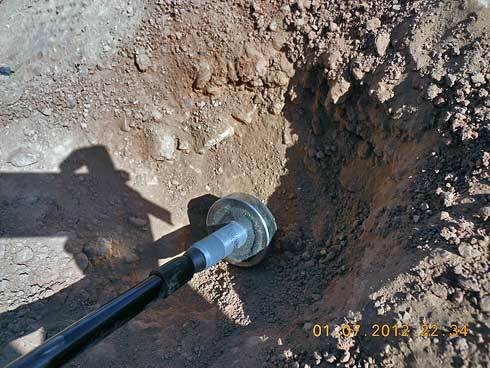 Hunters all around the World have benefited from the handy Meteorite Stick over the past year. The Meteorite Stick was used to hunt nearly every meteorite fall. Combining the perfect amount of adjust-ability, durability and portability, the Meteorite Stick has proven time and time again to be the perfect companion for any type of hunt. With its very powerful rare earth magnet the Meteorite Stick makes it possible to detect even those meteorites with ultra-low iron content, like the Martian fragments I discovered with my team. Through hard work, research and design, the right pieces fell into place and the Meteorite Stick became a reality. It is the foremost utilitarian tool for hunting meteorites and I am dedicated to making constant improvements in the design and performance. A lot of this drive is rooted in how I feel about my family history. My ancestors who are the Hayden family from Haydenville, MA were pioneers in American manufacturing. My kinfolk have had an extraordinary impact on American history, from the rural roots of manufacturing with the Hayden Brass Works to great philanthropic contributions that promoted the study of space science such as the Hayden Planetarium. I consider the Meteorite Stick a continuation of my predecessors success and contributions. What a great feeling it is for me to successfully follow the footsteps of previous generations. I’m proud to say through responsible direction, the Meteorite Stick is a powerful tool for promoting the education of outer space history.